Going about his everyday life of band rehearsals and socialising with his wife, Nina (Farmer), and their hip friends, rock drummer Roberto Tobias (Brandon) notices he is constantly being followed by a strange man dressed in black. He decides to turn the tables on his stalker and follows him into an abandoned theatre, where a confrontation between the two ends with Roberto accidentally stabbing the man, who falls into the orchestra, apparently dead. Suddenly, a flash of light alerts Roberto to a figure in the upper wings of the theatre, where a mysterious person wearing a bizarre puppet mask and brandishing a camera has been taking photos of the fatal struggle. Roberto flees the scene, but the next day receives the dead man's ID card in the post. Naturally assuming it has been sent by the unknown witness, he becomes immediately concerned by the lack of any blackmail demands and is haunted by the question of what it is the masked figure wants from him. Roberto's fear and paranoia increase, and the mystery deepens, when his and Nina's housemaid is found murdered in a local park and it becomes apparent that an intruder has had access to their apartment. 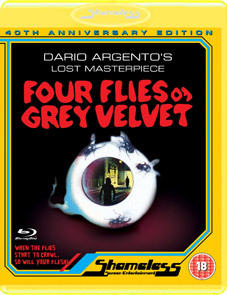 The final instalment in what is unofficially referred to as Argento's Animal Trilogy (following The Bird With The Crystal Plumage and The Cat O' Nine Tails), the enigmatically titled Four Flies on Grey Velvet (4 mosche di velluto grigio) is a classic of the giallo genre, featuring music by Oscar-winning composer Ennio Morricone (The Untouchables; The Mission; The Good, The Bad And The Ugly) and starring Michael Brandon (Captain America: The First Avenger; Dempsey And Makepeace), Mimsy Farmer (The Black Cat; More), Jean-Pierre Marielle (Micmacs; The Da Vinci Code), Bud Spencer (They Call Me Trinity) and Francine Racette (Au Revoir Les Enfants; The Disappearance). Forty years after its release and twenty years after the film disappeared from the public eye, Shameless Screen Entertainment is releasing the first ever worldwide Blu-ray of Dario Argento's lost masterpiece, Four Flies On Grey Velvet and, also for the first time ever, in the original version in which it was made. This special 40th Anniversary Edition has been fully remastered in HD from the original negative and includes four inserts of previously missing footage known amongst Argento fans as the legendary "missing forty seconds". Additionally, the original pristine English audio has been remastered exclusively for this Shameless release from the original magnetic soundtrack and is being made available for the first time since the film's initial theatrical release in the 1970s. Four Flies on Grey Velvet will be released on UK DVD and Blu-ray by Shameless Screen Entertainment on 30th January 2011 at the RRP of £15.99 for the DVD and £24.99 for the Blu-ray. The disc will feature the Shameless re-build edit of the complete version of the film including four inserts of previously missing footage known amongst Argento fans as the legendary "missing forty seconds" (the inserts are in Standard-Definition quality). The Blu-ray will allow for seamless branching of the four inserts giving viewers two versions of the film: one all HD without the re-inserted scenes and one longer version including the inserts. There has been restoration of all individual damaged frames, most notably with respect to the removal of the black diagonal frame line (caused by the film jumping the high speed camera gate) in the final car crash sequence. The optional Italian audio soundtrack in HD with English subtitles will be joined by the original English audio, remastered in HD exclusively for this Shameless release from the original magnetic soundtrack and available for the first time since the film's original theatrical opening in the 1970s. Shameless Trailer Park (Blu-ray only).